Discussion in 'Guitars in General' started by Murraypops, Dec 8, 2016. Wondering if anybody can help by telling me if this tokai mij has a solid or veneer top? crap photo I know but best I have atm. If you can see a shift in the grain pattern that follows a straight line that is where the cap or veneer is attached. It's a lot easier if one can hold the guitar vs a single pic. i would just research that particular model as much as possible to figure it out. 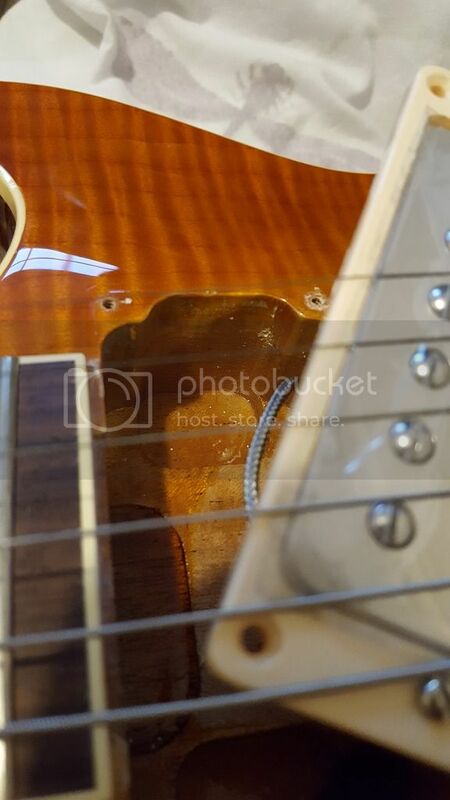 my tokai is a veneer and its impossible to tell by looking at it after it was finished etd. It's a cap. you can clearly see where the maple cap ends and the mahogany begins.. Very difficult to tell from this picture, but my best guess would be veneer on top of the maple top. Looks like a cap to me also, and a fairly thick one too. I think he knows it has a cap. I think what he's asking is if the cap is solid or if it has a veneer, like the PRS SE line does (maple cap with flame maple veneer). It's hard to tell if the grain extends down/thru the edge of the pickup route. When you zoom in it kinda looks like it might (meaning solid cap, no veneer) but it's too close to call for my eyes with this one pic. Looks like a maple cap with a veneer.